Back when I lived in New York City, whenever I felt flush with a little extra cash I would splurge on a great restaurant meal. --- Usually, that meant an all-too-rare treat, like dinner at the great Andre Soltner's Lutece restaurant, La Colombe d'Or, Lespinasse or, more often, a quaint West Village restaurant called Trattoria da Alfredo. It was named for its owner/chef Alfredo Viazzi, an outgoing bon vivant from Savona, Italy. Alfredo love the arts, writing, cooking and eating. He died suddenly and far too young of a heart attack in 1988. Recently, while rummaging through some old files, I came across a recipe I'd gotten from Alfredo for his pansotti alla salsa di noci: pansotti with nut sauce. I'd enjoyed this decadent dish many times at Trattoria da Alfredo, but had somehow forgotten about it. I hadn't eaten it in more than 20 years, since before I left New York. 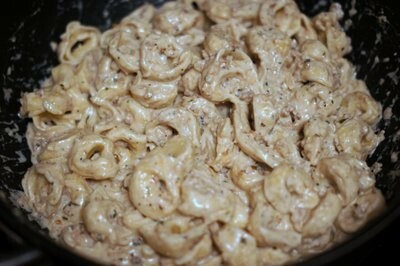 So, rediscovering Alfredo's recipe was like bumping into a dear old friend after a quarter century. 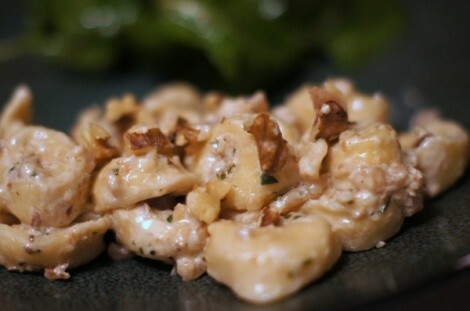 The following is essentially Alfredo Viazzi's pasta with walnut sauce recipe, although I tweaked it a bit to simplify it and reduced the original serving size. This recipe serves 3-4 people, but you could easily double it to serve 6-8. A little bit goes a long way; this is a very rich dish. I suggest serving it with a crisp green salad or veggies. 20 oz. 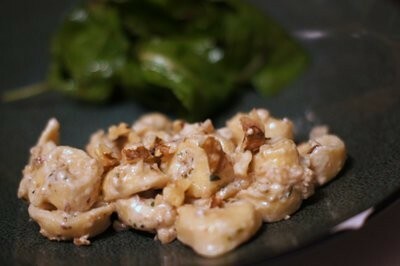 stuffed pasta, such as ravioli, tortellini, pansotti, agnolotti, etc. 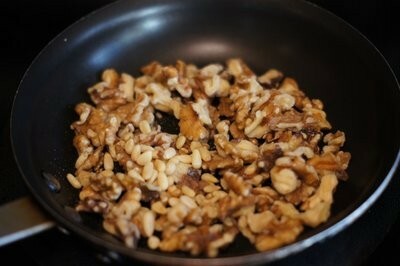 In a dry skillet over medium heat, toast the walnuts and pine nuts for a few minutes until lightly browned. 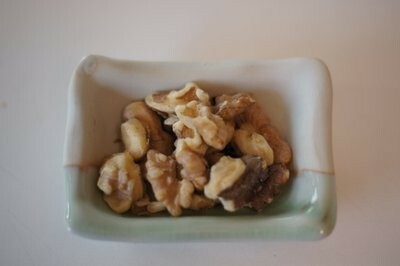 Toasting nuts before using intensifies their flavor. 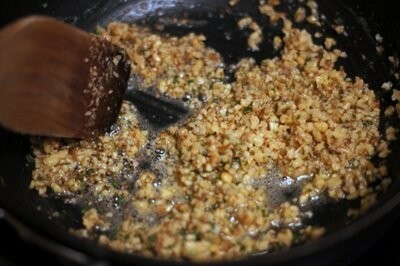 Set aside a tablespoon or two of the walnuts and chop them coarsely. These will be used for garnish. 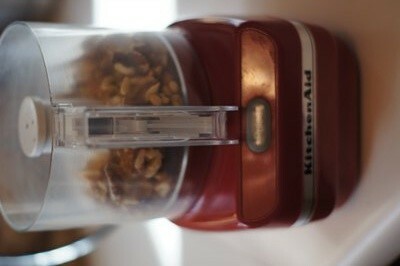 Place the rest of the nuts into a food processor or clean coffee grinder. 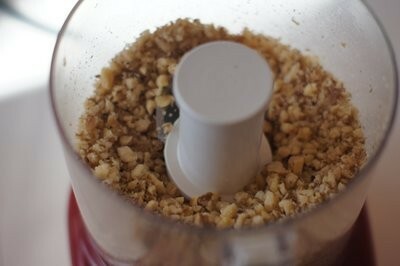 Pulse the processor until the nuts are coarsely ground -- not too fine. They should have the texture of nut topping for ice cream. In a large skillet, melt the butter over medium-high heat. 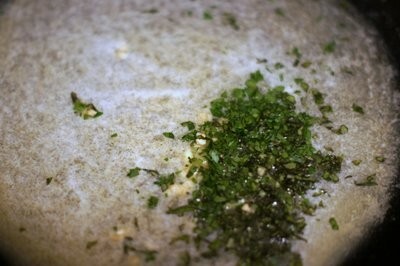 Then add the basil, parsley and garlic to the pan and cook until the garlic is softened, a couple of minutes. 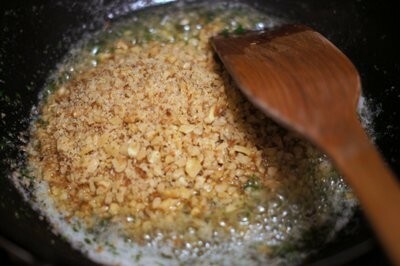 Add the nuts to the pan and cook, stirring, for another couple of minutes. Pour the cream into the pan and stir. 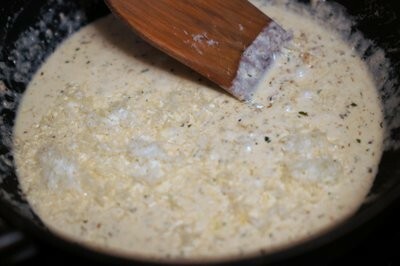 Reduce the heat to medium and cook the sauce until the cream has thickened some, about 10 minutes. While the sauce is thickening, cook the pasta according to package directions until just al dente. Drain well. 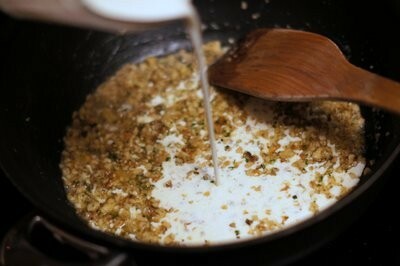 When the cream has thickened, stir in half of the Parmigiano-Reggiano. Reduce the heat to low. 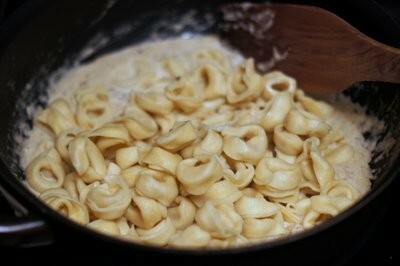 Place the cooked, drained pasta into the pan with the sauce and toss to coat the pasta well. Season with black pepper and salt, to taste. 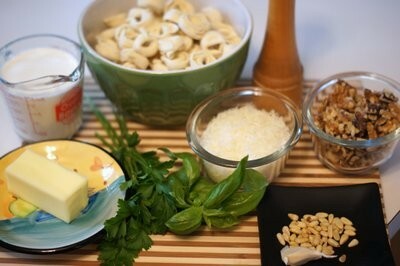 Serve the pasta garnished with the reserved chopped walnuts and sprinkled with the remaining Parmigiano-Reggiano.